I arrived at the site around 9.30 am after driving from Jackson – I am not capable of making this drive without taking a nap somewhere at the least, almost fell asleep several times. Of all the days that we have been without rain, it has finally decided to downpour. First rain in a month – figures. This is unfortunate as our morning was wasted waiting, although we (me, Jay Johnson, John Connaway, Cliff Jenkins and Rachel Stout-Evans) were able to plan for the upcoming week and eat at a Chinese buffet. Since it was a rain day, no students were at site. After our extended lunch, we returned on site amidst a slight, barely discernible drizzle. As this was the case, we began coring around mound C (according the William Henry Holmes map). Mound C is thought to be located fairly close to an old channel of the Mississippi River. According to Harold Fisk, the nearby channel was # 5 – this channel would have predated the mound on the surface by at least 1,000 years. I wanted to core in this area to determine if there were any buried deposits on which the mound was situated and the fluvial history of the landform. This plot of land is owned by the Archaeological Conservancy, who have been gracious enough to allow us to work on this area. 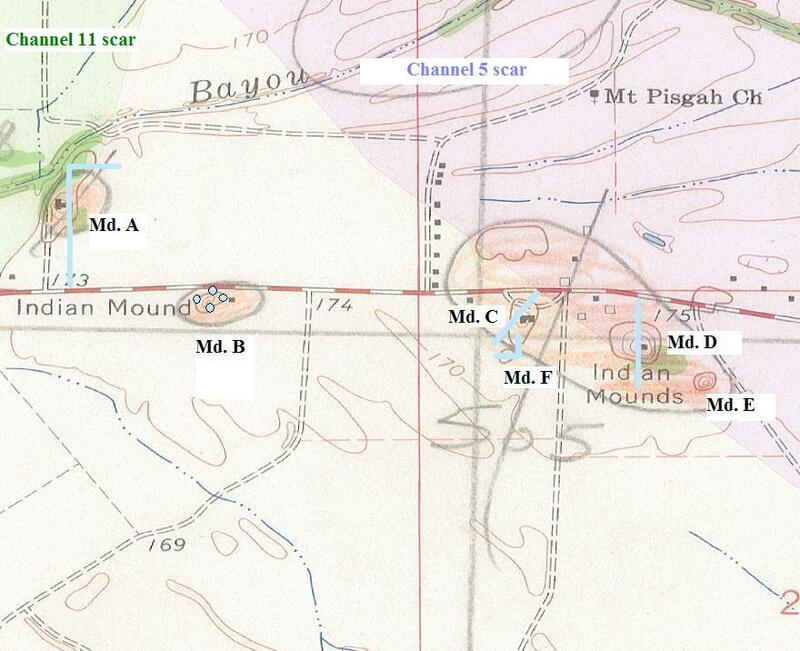 The map below shows channel scars, mounds and the locations of core transects. 1) Is this indeed one site? 2) If not, how many sites are there is this one contiguous area? 3) Where was the Mississippi River during the occupation(s)? 4) Were the residents preferring active water channel or closed oxbox lake ecosystems? Both allow organisms of varying types to flourish, perhaps indicating a varying degree of sedentism, etc. 5) Are there buried middens anywhere in the vicinity of this mile-long site (such as at Jaketown)? Core 1 was placed on the southwest flank of Mound C – detailed core data sheets are currently with Rachel and photocopies will be provided at the end of the week or during throughout. Rachel is using a Giddings truck-mounted hydraulic core unit with a bore width of approximately 1 and 5/8 inches. The core went down and released its cores relatively easily – this is most likely due to the torrential downpour from earlier. We went down approximately 360 cm below surface and encountered a variety of different soils in the core. Most importantly, we recovered a buried A horizon approximately 2 m below surface, and below which were natural subsurface soils. Intriguingly, we observed basket loading in the profile of C1 from 0 cmbs to about 1.5 m down (just a guess, refer to actual core sheets for the correct information). This is surprising because the flank of Mound C in this location looks relatively low and not that high above what I perceived to be the natural surface (the ground). I believe this indicates that over time after these mounds were built, there was some level of alluviation happening from a nearby active waterway. This is strange, because the data from core 2 (to be discussed below) seem to indicate that no active channel was nearby when the mound was built (personal communication with Rachel today). Based on the recorded soil profile, the abbreviated history of core appears as so, from the bottom up: there once was a natural levee, that was then silted and clayed over, and then a new levee appears on which the mound was then built. But while the natural levee was present when the mound was constructed, there most likely wasn’t an active channel nearby (based on soil weathering). We also retained a carbon sample and a humate sample to send off to be tested. 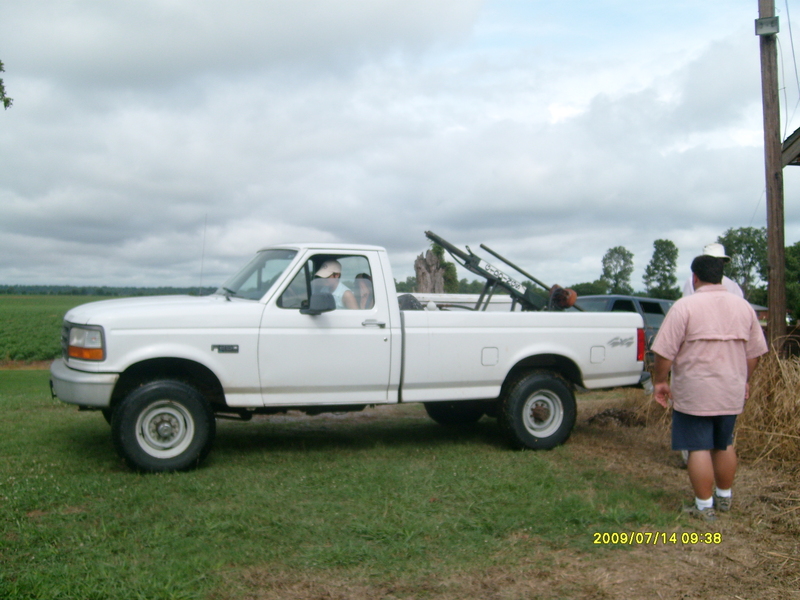 Core 2 was placed on top of Mound C. Coring did not proceed quite so easily this time because, as we would later learn, portions of the mound had extremely compacted soils (silt and clay). 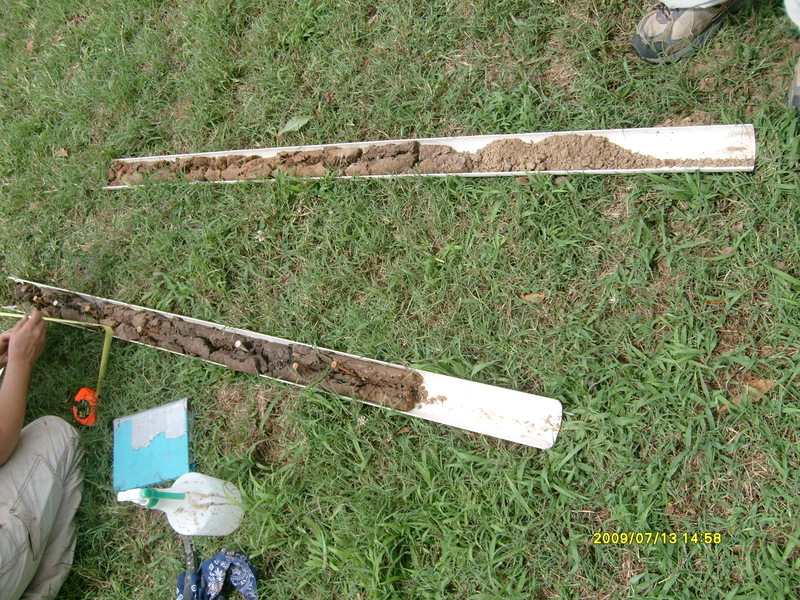 It almost appears as if they were looking for clay to put in their mound – the more likely scenario is that silts and clays were the most proximal soils. C2 was bored to approximately the same depth even though the surface level on top of the mound is at least 5 meters higher. We did not encounter any natural surfaces or buried A horizons. C2 extends about 360cm below surface and no water was encountered. I believe we’ll have to go down deeper to get to the buried A, perhaps as deep as 5 or 6 meters. We were only able to obtain 2 cores today, although we did some bushwhacking around the side of Mound F – we plan to core here as well later it the week. These two mounds are well situated to understand the geomorphology of the two major portions of this site since they are located between the Montgomery and Stovall portions of the site, and also between the old Mississippi channels 11 and 5.